The Georgia State cross country team wrapped up its season at the NCAA South Regional in Tuscaloosa, Alabama, on Friday, Nov. 10th. Freshman Lotte Meyberg was the Panthers’ top finisher on the day. Meyberg finished the 6K with a time of 21:27, enough to place 67th out of 228 runners. The Panthers finished 21st out of 40 teams. Sophomore Angela Alonso finished in the top-100 of runners. Going in, Head Coach Chris England knew that the competition would be tough. “We’ll see much better competition. The Regional is based on geography, so we’ll see all of the division one teams from Georgia, Florida, Tennessee, Alabama and Mississippi… It’s very stacked with SEC and ACC schools, so it’ll be quite competitive in the meet,” England said. Before this, the team competed in the Sun Belt Conference Championship. The Panthers placed sixth out of the 12 teams that competed in the meet. Meyberg placed seventh overall and helped the Panthers secure their sixth place finish. In the meet, Meyberg ran her fastest time 5K on the season with a time of 17:59. The Panthers also had two other runners finish in the top 40 of the of the race. Alonso finished 27th and Lindsay Shealy finished 37th. The Panthers did win a trophy on the day, as they were awarded the 2017 Sun Belt Team Academics Trophy for having the highest GPA in the conference. 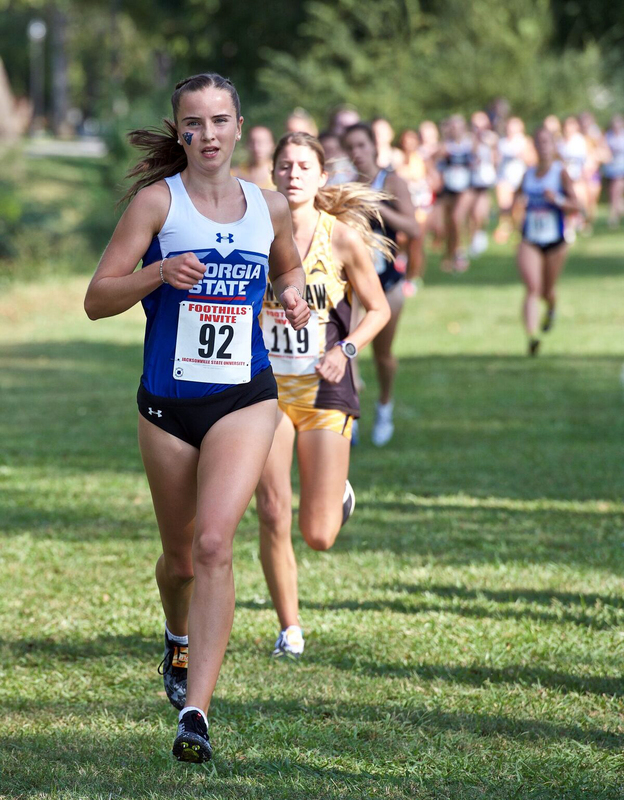 Prior to running at the Sun Belt Championship, the Panthers were rather fresh and only ran in six meets. Coach Chris England thinks it was to the advantage of his team. England believes that his team was rather fresh heading into the NCAA Regional. The team has shown signs of getting better throughout the season. Meyberg was consistently the Panthers’ top runner throughout the season. She has finished first in two races and in second place during the season. Meyberg has been one of the team’s top finishers all season. She placed first at the Foothills Invitational and the MC Invitational. At the MC she ran a 18:20, which was her fastest 5k of the season until she broke it later in the season. The Panthers would go on to finish second in that meet with the help of strong finishes from Morgan Laushey and Alonso, who both finished in the top eight. Next season, the Panthers will return its top runners from this team, which is something that makes England excited for the future.